It all started with an interesting observation by Georgetown neuroscientist Josef Rauschecker: if you asked him what order of the songs on his favorite Beatles album, he wouldn't be able to tell you. But he could sing along with a song and at the end he would be able to start humming the notes of the song that usually followed. To try to figure out what was happening, he had volunteers listen to their favorite CD while in a brain scanner. It turns out the area of the brain that was most active wasn't associated with hearing, but the brain's motor system, which is usually involved in controlling our muscles. Just like learning a sequence of dance steps or how to ski down a slope, our brain uses the motor control system to put together chunks of notes into the right order. Listen to the whole story on NPR. Unborn fairy wren chicks must learn a special "password" note from their mother while still in the egg. After hatching will only be fed by their parents if they can produce the correct "begging call" - this prevents any relatively enormous cuckoo hatchling interlopers in their nest from being fed. But some species of cuckoos are adapting: the cuckoo chicks may try out different calls until they find one that gets them a meal. Clever cuckoos! 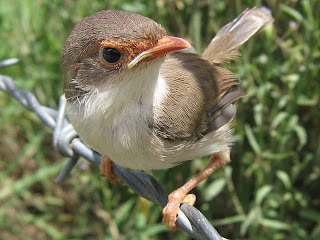 Image: Juvenile female superb fairy wren. This work has been released into the public domain by its author, LiquidGhoul at the English Wikipedia project. "We find that the major obstacle that hinders our understanding of the brain is the fragmentation of brain research and the data it produces. Modern neuroscience has been enormously productive but unsystematic. The data it produces describes different levels of biological organisation, in different areas of the brain in different species, at different stages of development. Today we urgently need to integrate this data – to show how the parts fit together in a single multi-level system." Learn more about the Human Brain Project.